I've always heard good things about Lazy Moon Pizza in Orlando near UCF, so I went to give them a try. When I first walked in, I was kind of surprized how crowded Lazy Moon was on a weeknight. There wasn't a seat in the place, but I was I luckily already had plans to get my slice to-go. 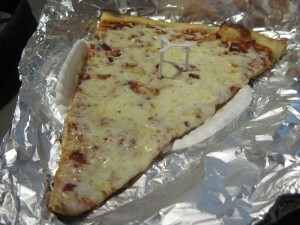 There were some issues with the girl behind the counter not understanding what I meant by ordering a "slice of plain." It seemed common sense to me in a restaurant that almost only serves pizza. Once my order was placed, I took a seat at the counter and watched the pizzas being made while I waited for my food. Lazy Moon was making the biggest pizzas I have ever seen, probably at least a meter in diameter. Lazy Moon was using an interesting cooking technique as well. The dough was tossed and covered with sauce, then put in the oven. After being half baked, the pie was removed and placed on a rack of cheeseless pizzas. From here, pies/slices were taken as needed, covered with cheese and toppings, and put in the oven again. I've never seen pizzas made like this, but soon my slice came out and I focused on my food. For a judge of the scale of how huge this slice is, that paper plate is the standard 12 inch diameter plate. I've had whole pies smaller than this one slice! Probably due to the way the pizza was cooked, the cheese on my slice didn't seem to be melted enough. You could still see the individual shreads of cheese which kind of gave it a frozen pizza look. After seeing the cheese like this, I wasn't expecting much, but it actually tasted pretty good. The crust was nice and thin, I liked the sauce, and there was definitely the factor of getting plenty of food for your money. My only issue really was with the cheese, and it was a pretty big issue for me. The pizza lost a lot of points in my book for having barely melted cheese, but apparently this is the way Lazy Moon makes their pizza. Judging by the crowds they had, it didn't bother many other people either. I may be back to try another slice if I'm in the area, but I'm not rushing. 4 out of 8 slices.